A picture may tell a thousand words, but a visionary artwork can communicate the indescribable. Sitaramaya Sita introduces a colorful collection of artists that can liberate your wildest imagination. 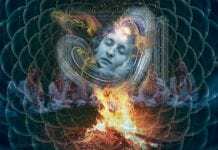 I often hear people say, “I cannot really describe it,” when speaking of their ayahuasca visions. And, it makes sense—how can we talk about otherworldly images and multiverses, the places and spaces of the ineffable, and non-linguistic experiences? Often, these experiences unfold in imagery that defies what we know and are able to see in the three-dimensional reality of our day-to-day consciousness. 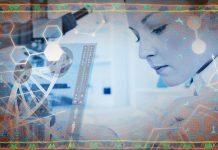 From the 1960s until now, this time of what many are calling the Psychedelic Renaissance, art and artistic expression have gone hand in hand with entheogenic states and experiences. 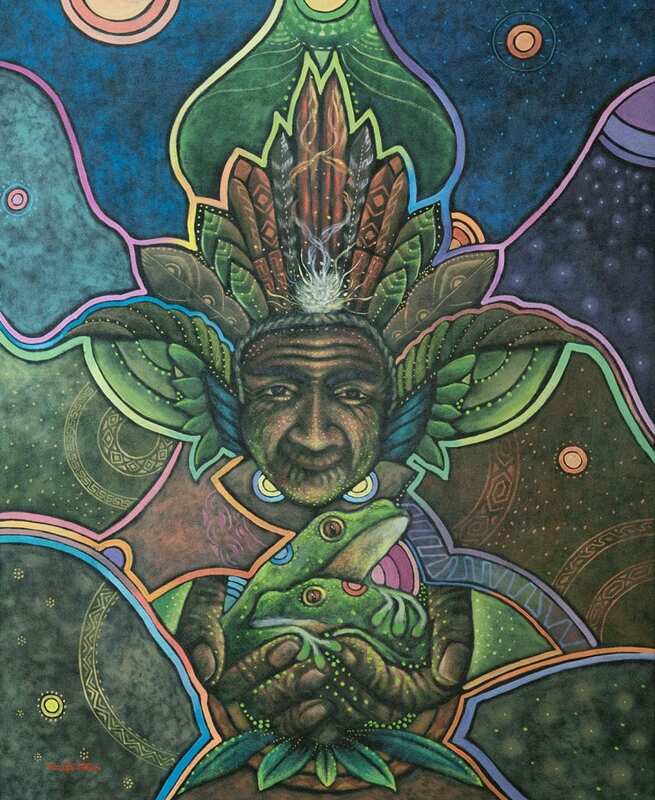 The first ever widely viewed ayahuasca paintings, by the late Pablo Amaringo, emerged from the Amazon jungles of the Ucayali region in Peru. 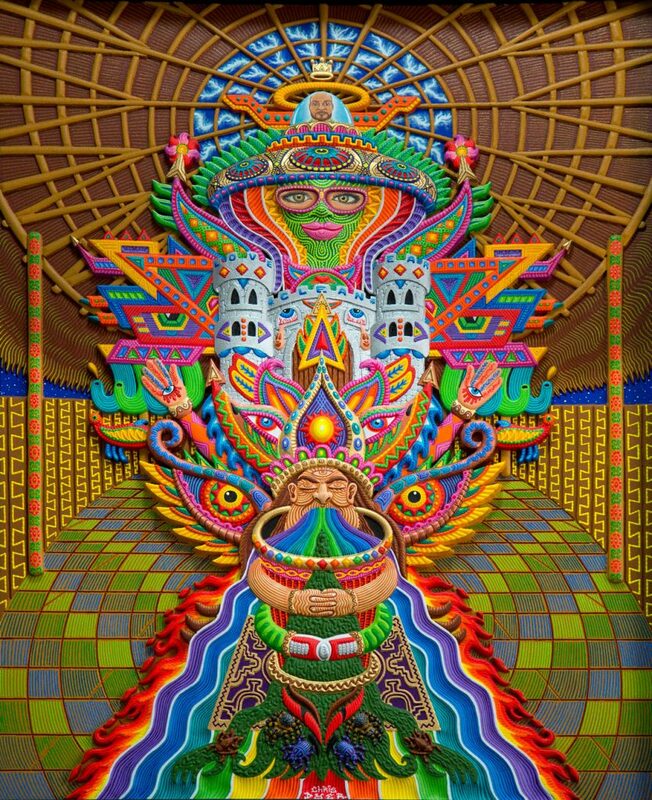 Pablo Amaringo is the father of contemporary ayahuasca visionary art. 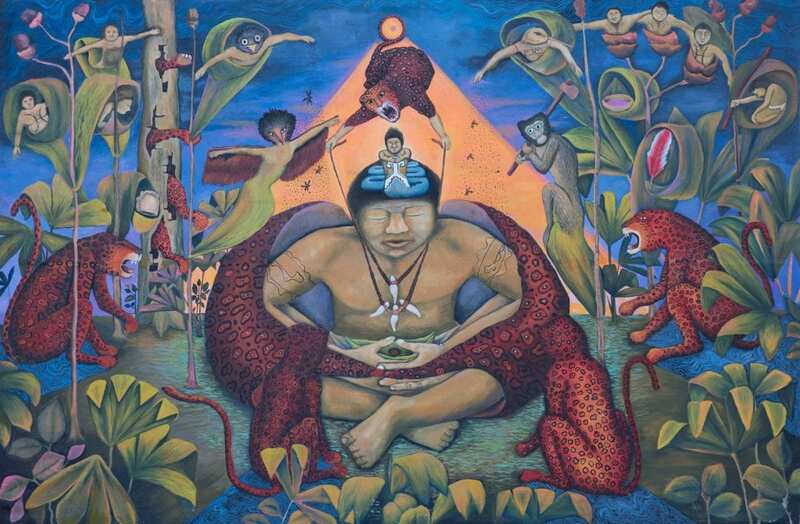 With the encouragement of anthropologist Luis Eduardo Luna, he birthed a cultural movement and an art style that not only captured and shared the rainforest waterways and landscapes of Amazonia, and the cosmological landscape of ayahuasca, but also helped foster ayahausca’s migration from the Amazon to the world at large. 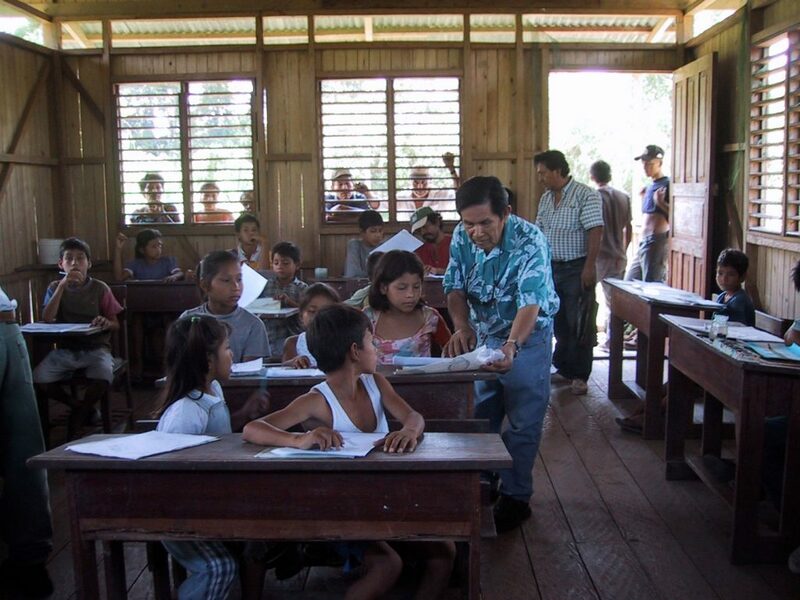 Pablo taught his Neo-Amazónica style of art to students of all ages for many years at the Usko Ayar School in Peru, first in the remote village of Alexandria and later in the jungle city of Pucallpa, inspiring a generation that continues to influence ayahuasca art around the globe. Pablo Amaringo at the Usko Ayar art school, 2003. Sitaramaya Sita and Pablo Amaringo. Peru, 2003. 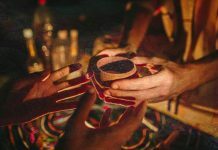 Making art and experiencing art can be a powerful, illuminating access point to help validate and integrate the internal visionary experiences that can happen when we drink ayahuasca. The ineffable, while not describable in words, can be approximated in the visual images we bring back. The good news is that for those of us who are not artists, we can view the images produced by artists, and when we do, we often recognize familiar landscapes, motifs, repeating imagery, colors, and textures. So, while we cannot describe “it” in words, we can “speak” about it in the language of art. And, in that, there is something comforting, something that tells us that we are part of something bigger than our individual selves. 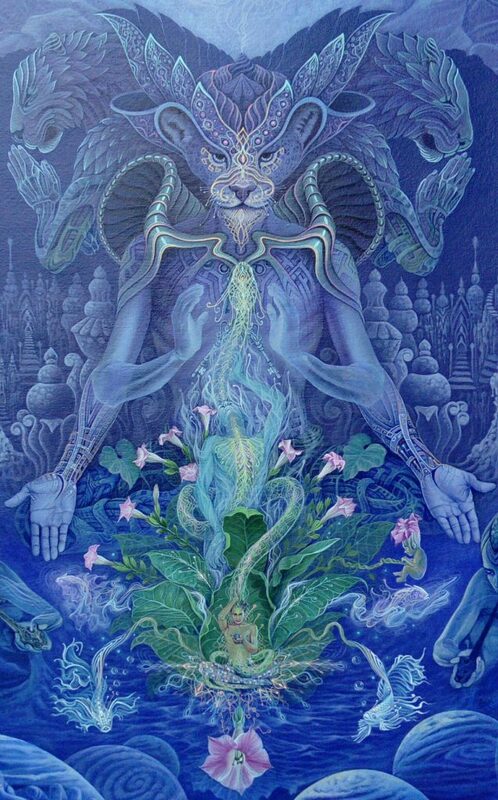 When we view a piece of ayahuasca or visionary art and recognize our own ayahuasca or visionary experience in it, without even knowing the artist we often feel our visions are validated and more meaningful. 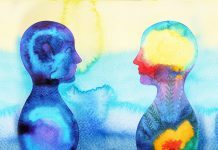 We can remember our connectedness, and the art can even rekindle or reignite the sensations, images, insights, and emotions that emerged in our ceremonial ayahuasca experience. I personally connect deeply and profoundly with art. I have a modest collection of indigenous and ayahuasca visionary art that I am honored to steward and share with those who pass through. I also host a virtual visionary art gallery on my PlantTeachers website. 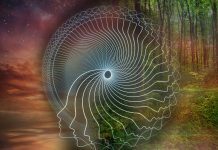 And as often as I hear people say, “I cannot really describe it,” I also hear people, when viewing ayahuasca art, say, “That’s what it was like!” This points to our common shared experience, our capacity to communicate it through art, and the reality that the art is a manifestation of the medicine. And the way I experience it, as do many artists, art itself is medicine. 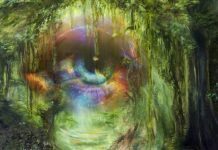 In the spirit of creating another access point to connecting to the world of ayahuasca art, I offer a serious disclaimer—the 11 here were very hard to select. There are so many amazing, powerful, and technically skilled visionary artists. Yet I felt compelled to do it. 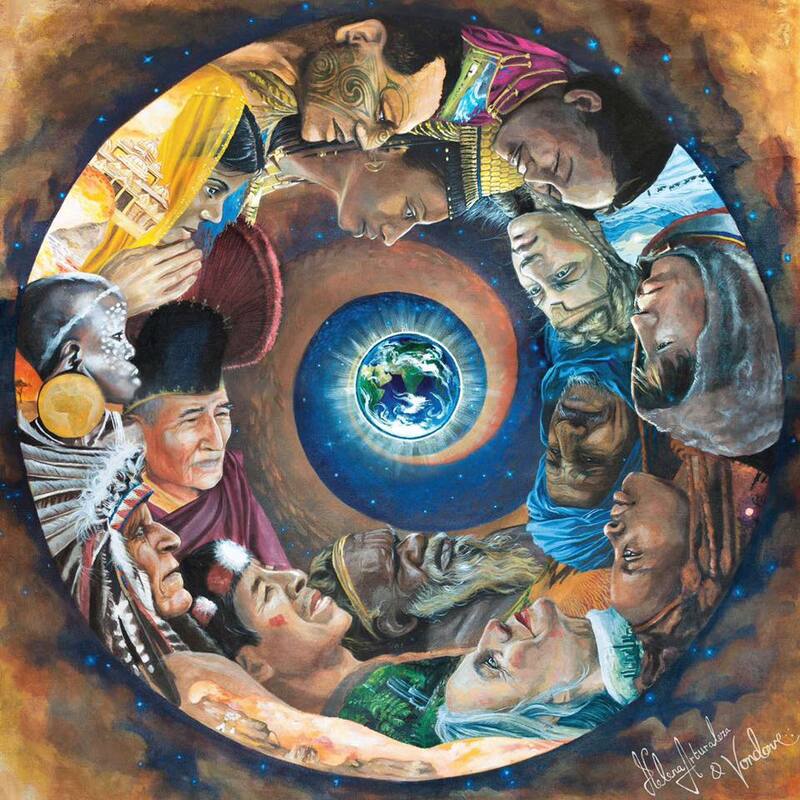 I have been looking at hundreds of artworks to make selections for “Ayahuasca and Visionary Art: A Coming Together of Cultures,” the art exhibit at the upcoming World Ayahuasca Conference in Spain this May. 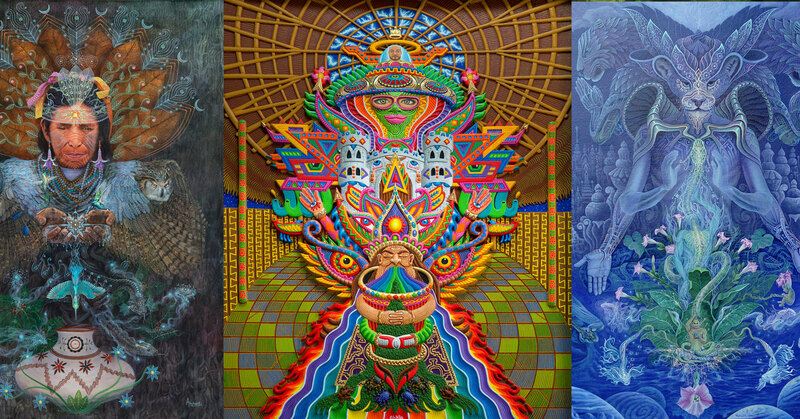 While we all know and love artists such as Pablo Amaringo, Amanda Sage, Luis Tamani, and Martina Hoffmann, it seemed fitting to highlight artists who might not yet be in the spotlight of visionary art or global ayahuasca culture. 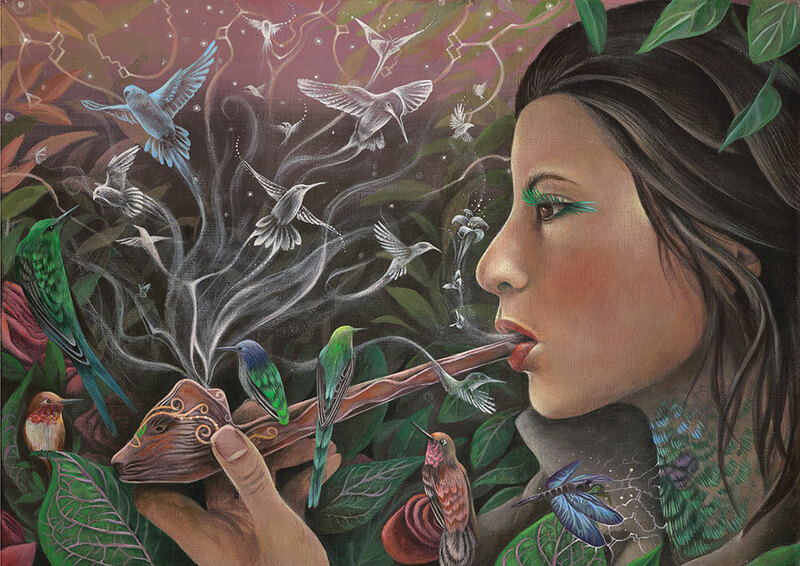 🌿See a massive collection of visionary art at the 2019 World Ayahuasca Conference in Spain. Tickets are available now! Vanni Mangoni – Like a cartographer of the dreamscape, Italian visual artist, filmmaker, and digital wizard Vanni captures and delivers a multitude of life forms, roadside attractions, and notable markers in the visionary landscape. His technical skill and classic form marry the fantastical quality of the scenes he depicts—nothing short of breathtaking and beautiful. “Amazon Vision” by Vanni Mangoni. Boris Quinteros – A keeper of wisdom and keeping ancestral traditions alive through art, Peruvian artist and social activist Boris brings his ceremonial visions to canvas and shares the colors of the jungle and the medicine of the cosmos, of the plants, and of the forest peoples delightfully and powerfully. His straightforward, yet complex, images pierce us in all the right places. Lobsang Melendez Ahuanari – A bright and shining artistic star on the rise from the Peruvian Amazon, Lobsang gracefully incorporates multicultural visionary motifs into Neo-Amazonian underpinnings to produce profoundly beautiful work. His raw, natural talent for capturing the human form can be seen in his skilled drawings. His paintings present cohesive, visionary stories that can take many, many viewings to fully comprehend. And even then, there is something we will either miss or want to come back to—again and again. “Ceremonia A La Vida” by Lobsang Melendez Ahuanari. 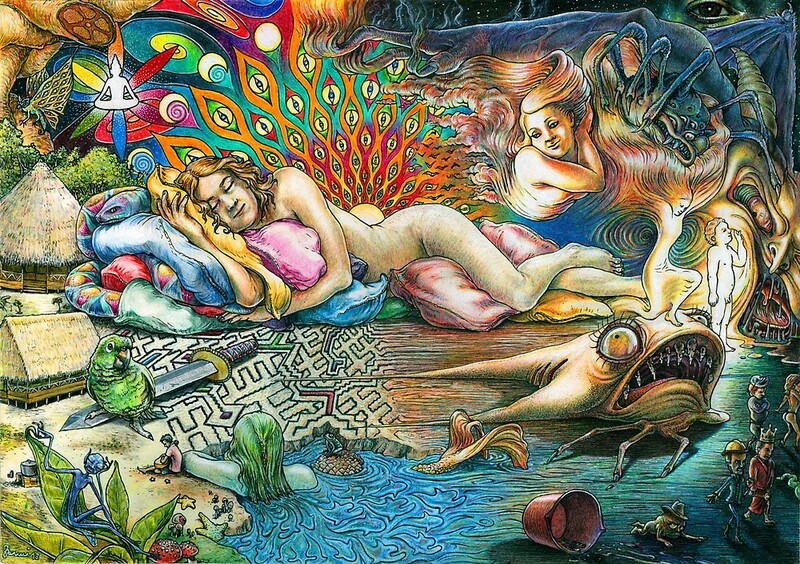 Li Lian Kolster – Deeply ayahuascarian, Li Lian’s art is a wonder to behold. 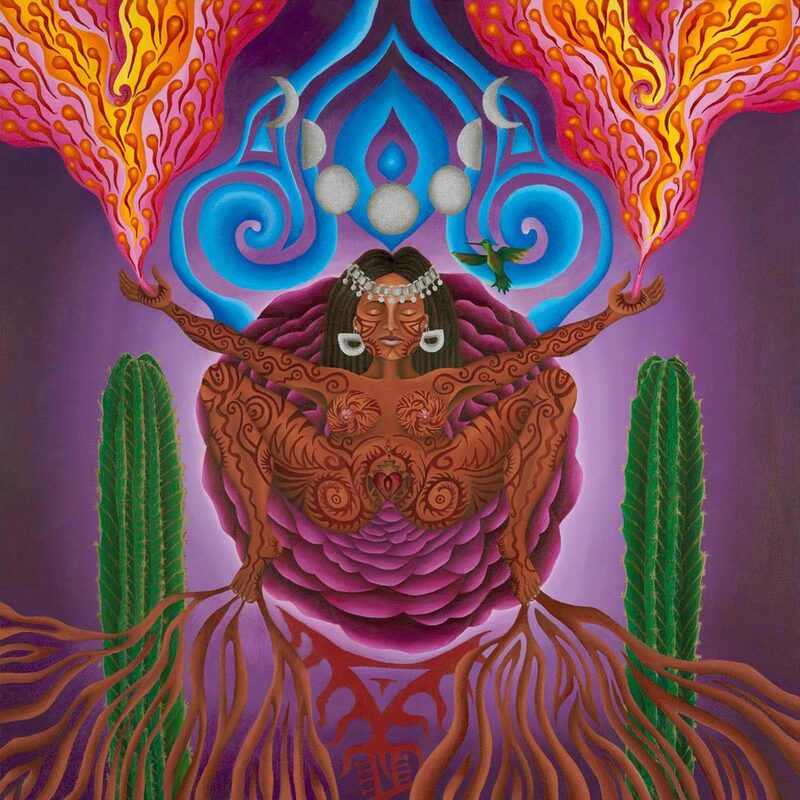 It is as if we can see ayahuasca when we look at her paintings. Her work reflects her deep communion with the plants she has dieted and her own biography. Li Lian possesses a precision and technical skill that never dominates but supports the top notes of tenderness and inspirational flash. 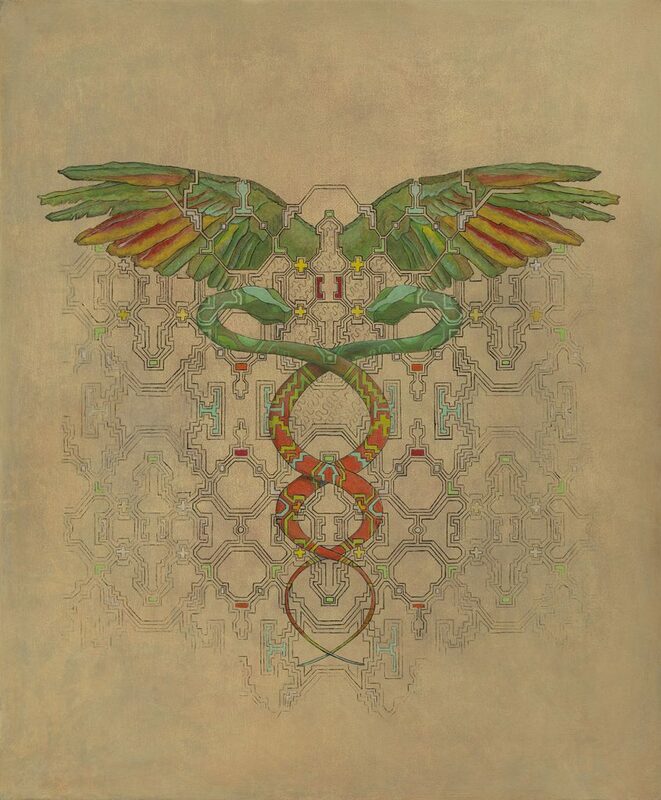 “Medicine Birds” By Li Lian Kolster. Rai wëni – Highly skilled in multiple art forms and mediums, Italian-born Rai wëni’s artistic acumen shines in his multilayered paintings depicting Shipibo cosmological designs. 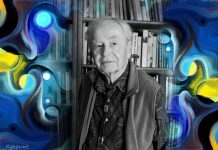 He paints his visions of the kënë (vibrational patterns), of the teacher plants, and of the representations of ayahuasca simply, elegantly, powerfully, and with a respectfulness and humility that invites the viewer, the experiencer, to pay attention. My mother used to say, “If you want someone to listen, then whisper.” Rai wëni’s paintings are whispers with meaningful messages that call us to bend closer, to listen deeply. Chris Dyer – Canadian painter, muralist, street artist, video producer, and writer Chris was born and raised in the skateboard culture of Lima, Peru. His unique, signature style and his self-styled “Positive Creations” are the kind art that stops us in our tracks. Brilliant colors and shifting, morphing kaleidoscopic designs jump off the canvas and catch our eye. And when we look closer, specific meanings and cohesiveness are revealed. Consider his piece, “The Purge.” At first glance, it can appear to be a random ride through a visionary wonderland. Upon closer examination, we see the Maloka, the set and setting of an ayahuasca ceremony, and the purge itself. As one dear friend remarked upon viewing this piece, “It looks like the visions when the medicine is coming on—makes me feel a little overwhelmed, like I do in ceremony.” While most artists might not want to create art that causes people to feel nauseated, in this case it is a high compliment. “The Purge” by Chris Dyer. Helena Arturaleza – Dutch painter Helena speaks to the heart. Her paintings convey a yearning, a desire, and the capacity for a world of oneness where there is room for all of us. Her work embodies hope, and her brushstrokes are optimistic. If art is a language then Helena’s art speaks in the dialect of mother earth—loving and nurturing without being trite. “One” by Helena Arturaleza and Vondove. Mariela de la Paz – A Chilean-born mestiza, artist Mariela brings the vibrant colors of the natural world, of Latin America, and the visionary landscape to life in a way that is uniquely her own. Drawing inspiration from indigenous plant medicine practices, Mariela’s art showcases both the otherworldly forces and the elements we can see, feel, and touch in this earth-bound world. Her paintings are a rich slice of plant medicine life served with skill and powerfully polished with grace. Brus Rubio – Through his works on canvas and llanchama (tree bark), indigenous Peruvian artist Brus shares the mythology, history, and culture of the Bora and Huitoto peoples and provides a rare view into the cosmology of these tribes of the Amazon basin. Brus conveys the fundamentality of the visionary states in everyday activities and in the natural world itself. The leaves look like leaves, and embedded in the leaves are feathers and birds with human bodies and things that our mind tells us “shouldn’t be there;” but our heart, when we see them, knows they are perfectly placed. “La Concentracíon” by Brus Rubio. 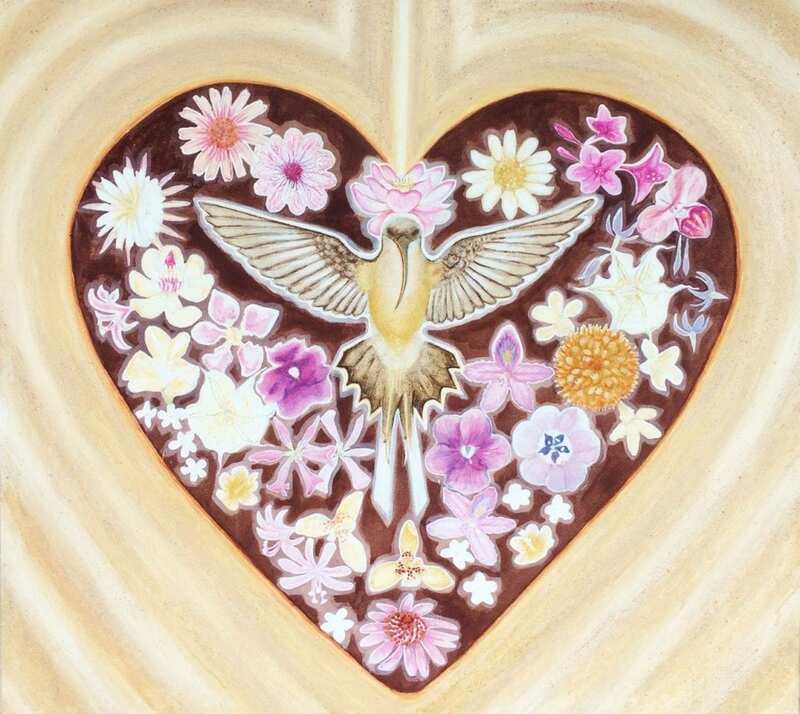 Geenss Archenti Flores – One of the new generation of Peruvian visionary artists coming out of the Tarapoto area of Peru, Archenti uses natural pigments he prepares from trees and medicinal plants in brushstrokes that powerfully portray the flight of light. 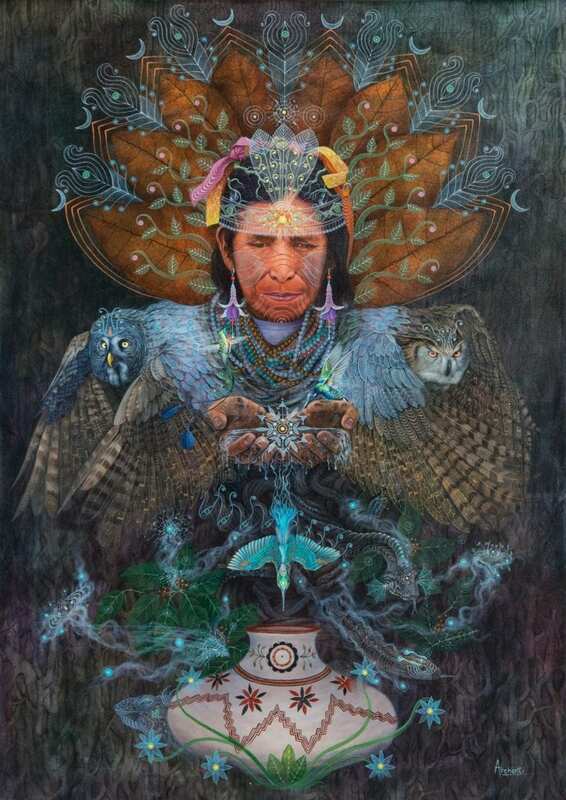 Like the medicine itself, he enchants us with mesmerizing pinpoints, feathers so textured you want to reach over and touch them, repeating designs fading into infinity, and faces and flowers both lifelike and adorned with that ayahuasca visionary quality that cannot be explained in words. Archenti uses actual medicine pigments in his pieces and often paints on handmade banana leaf paper, an organic offering that brings the Amazon to us in the art pieces themselves. Archenti reminds us that we need this kind of communication—the one that speaks to us in the language of art. “Ampikuk Payay” by Geenss Archenti Flores. Trina Brammah – English-born artist, mother of two, and founder and director of Sachaqa Centro de Arte, an ecological art retreat and art residency center in the Peruvian Amazon, Trina paints with natural, found pigments from earth and rocks that she personally wildcrafts. Viewing her art, we can feel the earth and the rocks and her love and respect for the natural world emanating from the canvas. Trina’s work is soft and sweet and strong. The light in her work seems to be shining down from the sun itself and pouring out from within the plant, animal, and human beings she depicts. She calls us to taste the sweetness of the beings, and ultimately, through her art, calls us to connect with the sweetness within each of us. “Into the Heart” by Trina Brammah. Sitaramaya Sita has traveled, worked and studied extensively in the Amazon for the past 17 years.She is a spiritual herbalist, pusangera and plant wisdom practitioner formally trained in the Shipibo ayahuasca tradition. She is the Founder of PlantTeachers, dedicated to cultivating entheogenic awareness, and producer of the Visionary Convergence conference.Sita stewards a 70 acre land conservation project in the Peruvian Amazon.She lectures, teaches, and works with individuals and groups in ceremonies and guides plant dietas. Sita currently trains, teaches and practices to heal personal, institutional and cultural trauma. She is an art curator and organizer of Ayahuasca & Visionary Art: A Coming Together of Cultures the art space and exhibition at AYA2019 in Girona, Spain.